We all know that the iPad is still the tablet to beat, but the kind of dominance it enjoys in the tablet market doesn’t cease to amaze us. According to the latest estimates, provided by the market analyst from Canaccord Genuity, the Apple iPad and iPad2 will account for 65% of all slates shipped in 2011. Despite the increased competition, the iPad managed to stand its ground and Apple will complete the year as the largest tablet manufacturer by selling north of 39 million units. According to the estimates, Samsung will come in second, shipping just 5 million slates, whereas Asus will somewhat surprisingly catch third place with 3 million tablets shipped. Amazon is expected to ship about 2 million units of its tablet (which will only be released on November 15), but according to the analysts, the Kindle Fire is not a threat to the iPad dominance either. Instead, the affordable Android-based slate will eat into the share of the other Android manufacturers. 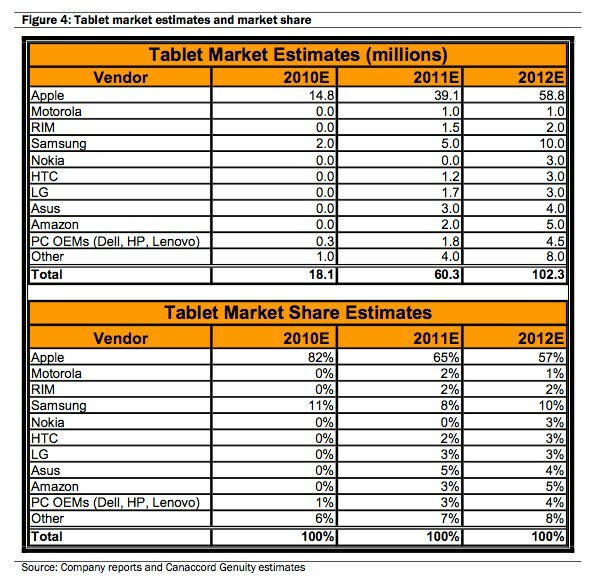 That’s why 2012 shouldn’t see a dramatic change in the picture with Apple still expected to account for more than half of all tablet sales. Samsung should also start to pick up pace and Amazon should move into third, but the other manufacturers are expected to continue with their struggles. The just announced Nook tablet by Barnes & Noble sound like an interesting tablet too – with its dual-core CPU and 7-inch 1024×600 anti-glare IPS color display.